Petisyen yang dilakukan oleh Cassandra Chung Li Hooi kepada University of Nottingham supaya “Removing Dato’ Seri Najib Razak’s portrait at the University of Nottingham” adalah satu penghinaan yang tidak dapat diterima oleh negara ini. Mohd Najib Tun Razak adalah Perdana Menteri Malaysia telah dipilih secara demokratik dan mengikut Perlembagaan. Justeru untuk seorang pelajar Malaysia membuat pestiyen sebegini kepada universiti luar negara dan membuat tuduhan-tuduhan yang beliau sendiri tidak pasti kebenarannya adalah satu tindakan pengkhianatan kepada negara. Suatu hari nanti tidak mustahil apabila pulang beliau akan mensabotaj negara sekiranya tidak bersetuju dengan pimpinan negara ketika itu. Eloklah Timbalan Menteri KDN, Datuk Nur Jazlan Mohamed melihat tindakan yang perlu dibuat ke atas pelajar ini. Ini bukan soal demokrasi tapi membabitkan maruah negara di universiti tersebut. Sesiapa yang tahu mengenai keluarga pelajar ini juga boleh beri maklumat kepada saya. Kita mahu melihat sesuci mana pula keluarganya yang mampu menghantar anak ke luar negara ini. The person who started the online petition urging the removal of Prime Minister Najib Abdul Razak’s portrait from his alma mater University of Nottingham in the UK has received threats to herself and her family. A Facebook user, Ab Jalil Backer, has urged Deputy Home Minister Nur Jazlan Mohamed to take action against Cassandra Chung, the student at the University of Nottingham who started the petition. Not only that, he has also urged the public to provide him with details of Chung’s family. “Whoever knows anything about this student’s family, do give me their information. “We want to see just how pure this family is who can afford to send their child overseas,” he said in a Facebook post. He described Chung’s petition as an insult which cannot be accepted by the country, and reminding that Najib was democratically elected. Chung’s act of starting such a petition overseas and making false accusations, he said, is akin to an act of betrayal to the country. “One day, when she comes back, it is not impossible for her to sabotage the country if she disagrees with the country’s leadership then,” he said. An online petition calling for the removal of Prime Minister Najib Abdul Razak’s portrait from his alma mater University of Nottingham in the UK has broken over 2,000 signatures shortly before the deadline. Less than 30 minutes before the 11.59pm deadline for the motion to be submitted yesterday, the petition, started by one Cassandra Hooi, had garnered 2,252 signatures. The motion calls for the Malaysian Society to lobby for the removal of Najib’s two-metre high portrait from one of the walls of its campuses (King Meadow). The motion is meant to be a sign of protest against Najib’s refusal to properly explain the deposits of RM2.6 billion into his personal bank accounts. If the motion, backed by the petition, is approved, it will be debated during the varsity’s Malaysian Society’s AGM on March 16. YOU DO NOT NEED TO BE A STUDENT OF UNIVERSITY OF NOTTINGHAM TO SIGN THIS PETITION! All of us by now would be familiar with the 1MDB scandal that has hit international headlines especially after the Sarawak Report leaked documents on transfers amounting to over RM 2 billion into Dato’ Seri Najib Razak’s (our Prime Minister [PM]) personal account. The news has not stopped with the most recent being The Economist which did a three page spread on the scandal. The government’s response to this fiasco has been less than desirable. The sacking of the Attorney General (AG) is surrounded in suspicious circumstances considering he had just begun drafting a charge sheet against the PM at about the time he was sacked. The Cabinet reshuffle had also happened during a time when members from the former Cabinet had begun speaking out on this issue. The allegations are completely false. The money was held by the PM for the United Malay National organisation (UMNO) on trust. It was a political donation. In the past year, the government has either rescinded from either one of these explanations and switched from one explanation to another thus casting doubt on the validity on any of these claims. As of now, the PM has not been held accountable for these vast monetary transactions. The newly appointed AG has decided not to charge anybody citing the fact that the money received was a mere political donation. The ethics of such a claim is certainly questionable but alas, with the AG refusing to charge the PM, we are left with a situation whereby our PM may never have to answer questions in regards to this suspected money laundering. As regular lay-people, many of us may feel helpless against holding Dato’ Seri Najib Razak to account for the money in his personal bank account. Some of us may feel anger because of the belief that the money in the account isn’t from Saudi Arabia as claimed, but rather from tax-payers money. The recent budget cuts (i.e. revocation of the JPA scholarships) may have further made this more personal to us. Collectively, we hold more power to speak up against this than we realise. As some of you may be aware, in the University of Nottingham, United Kingdom (UK), there is a huge portrait of our Prime Minister on one of the wall of its campuses (Kings Meadow) which stands at the height of 2 metres. What is this petition for? That the University of Nottingham Malaysian Society lobby the University of Nottingham (UK) to take down the portrait as an expression of a collective act of disagreement on the Prime Minister refusing to answer for the suspicious circumstances surrounding the transfer of the RM 2.6 billion into his account. This simple act is capable of sending a strong message to our PM that it is time for him to answer truthfully and clearly to the allegations. The University of Nottingham shares good relations with our PM seeing that he was an alumni hence, once the removal of that portrait is made public, it will be a strong and significant symbol of our collective disagreement towards our PM’s unsatisfactory responses. How will lobbying be done? The Malaysian Society Annual General Meeting (AGM) will take place on 16 March 2016 at the Law and Social Sciences (LASS) Building from 4pm onwards. The room is at the moment, not confirmed yet. I (Cassandra Chung) together with my fellow seconder (Justin Ong), intend to submit a motion to lobby the Society to lobby the University to take down the portrait; we will do so once there are 100 signatures to this petition. The final date to submit a motion for debate will be 11.59pm, 10 March 2016. We are aware that the motion may not be approved for debate hence, this petition needs more than 100 signatures to show to the Society that this issue is worth considering at AGM. If the motion is approved, it will be debated during the AGM itself and whether it will be passed will be subject to what the majority votes for (which hopefully, will be to take down the portrait). If you are a student at the University of Nottingham, UK, do drop by the Malaysian Society’s AGM next week to cast your vote on the motion (but do register as a member of the Society first!). So what are you waiting for? Sign the petition and share it with everybody you know! Cassandra Chung started this petition with a single signature, and now has 2,717 supporters. Start a petition today to change something you care about. 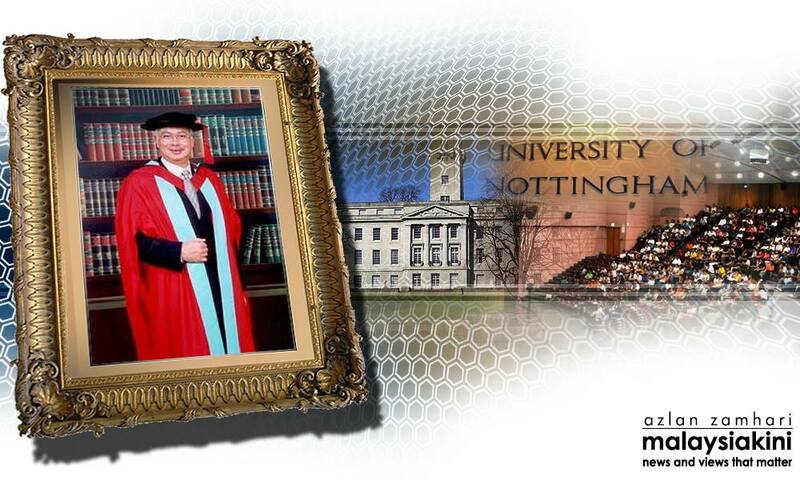 This entry was posted in Uncategorized and tagged Najib Razak, najib razak: alma mater Univ of Nottingham, najib: Petition to have Najib's alma mater portrait removed, Petition: Removing Dato' Seri Najib Razak's portrait off the University of Nottingham. Bookmark the permalink.